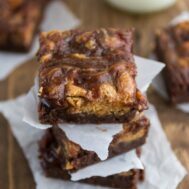 Peanut Butter and Jelly Brownies - this easy brownie recipe is full of peanut butter and jelly! PB&J goes so well with chocolate...and everyone loves brownies! Preheat oven to 350°F. Line a 9x9” pan with foil and spray with cooking spray. Place the two baking chocolates and butter in a large, microwave safe bowl. Heat on HIGH power for 2-3 minutes, stirring every 30 seconds, until chocolate is smooth. Stir in sugar. Add eggs, vanilla, salt, and cocoa and stir well. Add flour and stir carefully. Spread batter in prepared pan. Stir together peanut butter, melted butter, powdered sugar, and vanilla. Drop spoonfuls on top of the brownies then swirl with a butter knife or the back of a wooden spoon. Place the jelly in a small bowl and stir until smooth. Drizzle over the brownie batter and swirl like you did with the peanut butter. Just be sure to keep the jelly away from the edges of the pan or it will boil and bubble during cooking. Bake about 28-35 minutes, until they are slightly cracking around the edges. Note: these are gooey brownies in the center. I like mine gooey, so I baked them 29 minutes. If you want them more done, you might want to cook them a few extra minutes. Let cool before slicing into bars.